Although this is slightly off topic, and not really aligned to the #BanBPSD series I planned for September 2018, I wanted to share this blog today, and reviews about my books, one which I wrote, in essence, as an attempt to normalise dementia. 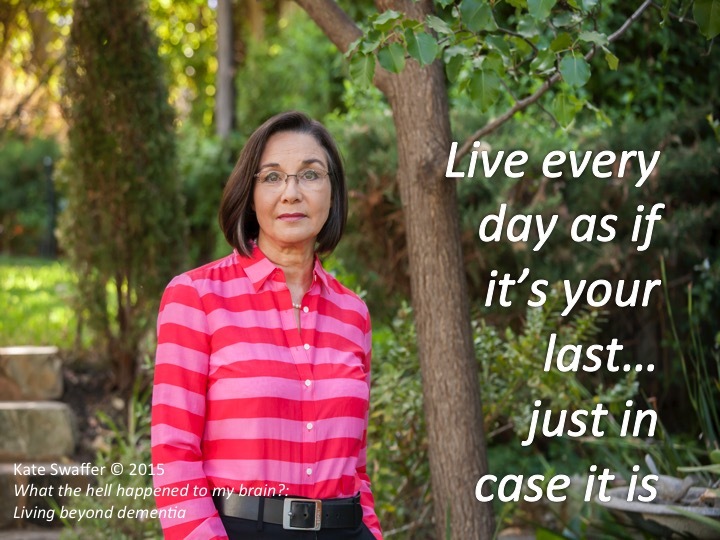 In 2016, I published two books, one called “What the hell happened to my Brain: Living beyond Dementia”, and the other called Diagnosed with Alzheimer’s or Another Dementia, co-authored with a colleague and friend, Lee-Fay Low. Both have been well received, but I do really want to update both of them, in particular on the matter of BPSD. However in spite of that term being used in both, I have been told both books are helpful and useful books. Dr Shibley Rahman also wrote a foreward for my book, which I was thrilled with. Richard Taylor wrote and videoed a Foreward for my first book, which I’m publishing again today. Others have sent me wonderful reviews, for which I thank them. One review on Amazon was more negative, but hey, that’s ok too, after all, a review is just someone’s opinion, and in no way do they validate OR negate the value of my lived experience of dementia. Jessica Young wrote a review of my book, and in the true meaning od “Nothing about us, without us” asked me to respond to her review. That in itself was a very unique experience, as initially, I had no idea is she like my book! 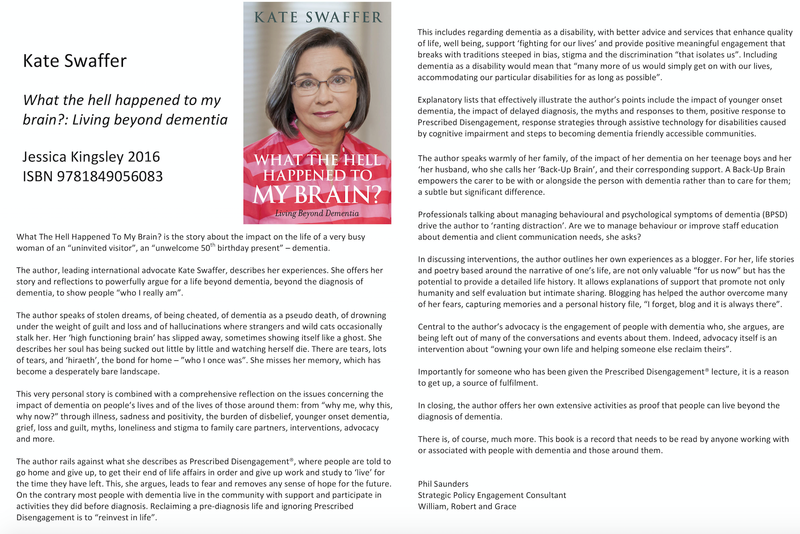 The review by Professor of Dementia Research, Faculty of Medicine & Health Sciences, Nottingham University on 30 December, 2016, was also reproduced with permission on my blog. Mary Radnofsky also sent me a short review of my book sometime after she joined DAI, which is very meaningful to me, and which is published below.She wrote (2017) in a piece titled Great Reads about Living with Dementia, Just my opinion… Mary L. Radnofsky, Ph.D. Thank you to the late Richard Taylor and Susan Suchan, and to Tom, and Jessica, and Mary, and Phil, and everyone… thank for daring to think differently about dementia. I am truly indebted to you all. Thanks for all that you do, Kate. oops-post this twice so you are more than welcome to delete one-whatever you thinks best-sorry about that. Thank you for that-i appreciate that-and i will try not to do it again–promise! I’m putting a link to that video in the email I’m sending to the Alzheimer Society of Ontario re their “Every 3 seconds” ad. I’m sending the email today. Thanks for suggesting the charter, which I didn’t add due to length. I may have the opportunity to use it another time. Thanks Kate-i am ok thanks-just lots of dramas with my Grandad’s home help and my Grandmas attitude to my Grandad have warn me out. My Grandad is deteriating really fast-has no idea what is happening but still can recognise us. His communication skills has decreased significantly and he can only walk about 100 meters or so know. I think of you too often and it is always lovely to chat on here. I am in the process of looking at rest homes for him. I am going to a rest home on friday to have a look. My Grandma is continually being mean to him-she gossips crap about him behind his back and calls him fat she said to me on the food today that he is getting way to fat-so cruel. She laughs at him. So sad. Yes, it sure is very difficult and emotional-especially with my Grandma’s attitude and refusing to do nothing and talking crap about him behind his back makes it nothing but raw.